From Roanoke County Fire EMS: Update 4:30.: Catawba Valley Drive (USR 311) between Absalom Smith Road and McAphee’s Knob Trail parking lot is now open after it was closed due to a brush fire in the area. From Roanoke County Fire EMS: Update 9:00 p.m.: Many of the crews from Roanoke County Fire and Rescue have been cleared for the evening. The U.S. Forest Service will be handling most of the firefighting duties overnight. Roanoke County will be providing 7 people, a firetruck and an ambulance for the overnight shift. Catawba Valley Drive will remain closed until approximately 11 p.m. tonight and motorists are urged to use caution in that area. Roanoke County Fire and Rescue would like to thank the Roanoke Moose Lodge, located on Catawba Valley Drive for their generosity in letting us use their parking lot and building as a staging area for crews working this fire. 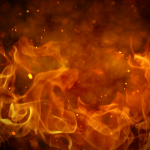 From Roanoke County Fire EMS: Update 7:10 p.m.: This fire is being handled by a unified command of Roanoke County Fire and Rescue, Virginia Department of Forestry, and the U.S. Forest Service. Most of this fire is on federal land and the U.S. Forest Service estimates the size at 325 acres. There are approximately 80 total personnel fighting this fire. There were some structures threatened in the early stages of the fire but all of those were protected and there are currently no structures threatened. There are currently 2 helicopters operating with air water drops on this fire. There have been no injuries. Catawba Valley Drive remains closed at Absalom Smith Road and the Appalachian trail from the parking lot at the top of Catawba Mountain out McAfee’s Knob remains closed as well. The U.S. Forest Service plans to have crews on this fire overnight and into the morning. Roanoke County Fire and Rescue will assist them with medical support and some firefighting support as well.